Although pathologists might be the silent partner as far as patients are concerned, they work in tandem with a team of radiologists, surgeons, and oncologists to ensure an accurate diagnosis is made so that individualized treatment can be instituted. A breast cancer case usually originates with an abnormal mammogram or a palpable lump discovered by the patient or the patient’s physician. If the mammogram is abnormal, patients typically undergo a stereotactic needle core biopsy or ultrasound guided needle core biopsy. It is those cores, tiny cylinders on a slide that can be magnified up to 400 times under the microscope, that are the first tissue a pathologist will examine. The radiologists usually perform these biopsies, and the tissue is then sent to the pathology lab for diagnosis. The pathologist is tasked with making a diagnosis and ensuring that diagnosis is consistent with the lesion described in the mammogram. If a malignancy is found, patients are referred to a surgeon for a lumpectomy or mastectomy and sentinel lymph node biopsy. The pathologist will evaluate the excised breast tissue and document the size, grade, margins, lymph node status, and hormone receptor status of the tumor. These findings will determine the stage and treatment algorithm for that patient. “The size of tumor is critical, since most malignancies less than a centimeter do not generally receive chemotherapy.” says Jones. Size is evaluated microscopically and grossly and measured in three dimensions whenever possible. 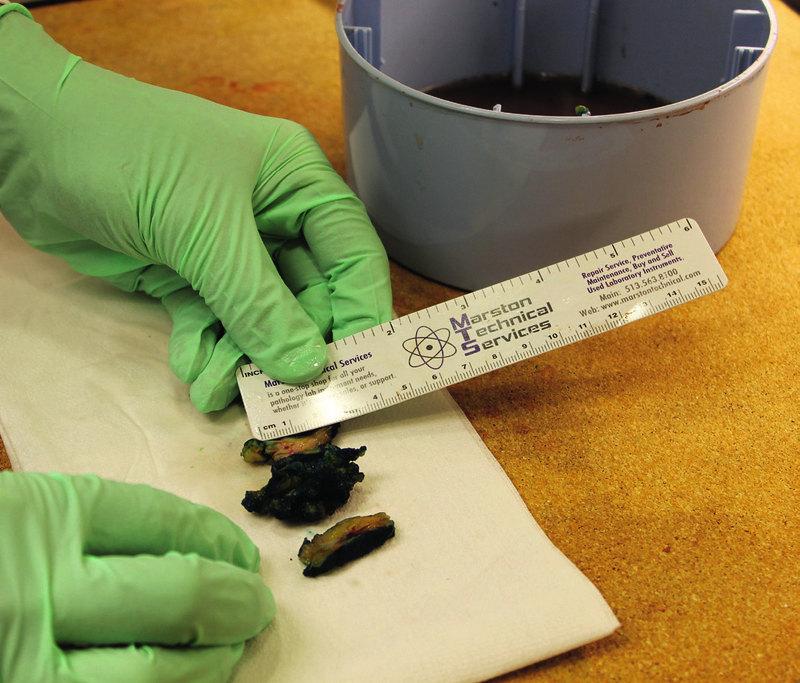 Margins are measured by applying ink to the exterior of the specimen and fixing it with a mild acidic solution. When the pathologist takes sections from the specimen and examines them under the microscope, they try to establish the distance between the cancerous tissue and its closest inked margin of resection. This ensures complete local excision of the tumor. Hormonal status is another indicator pathologists measure, which dictates subsequent treatment. “We perform estrogen and progesterone receptors (ER and PR) on all tumors and HER2 status. The results of those will determine whether patients are treated with tamoxifen or other anti-estrogen drugs or Herceptin,” says Jones. Currently all three tests are sent out to another laboratory, but soon Floyd Memorial will be bringing ER and PR testing in-house. During surgical excision, surgeons perform a sentinel lymph node biopsy to determine whether lymphatic invasion is present. Utilizing a radioactive tracer and blue dye injected as close to the cancer as possible, they demonstrate “which lymph node drains the lesion initially,” Stapp explains. That sentinel node will be examined with an immediate frozen section by a pathologist, while the patient is still under anesthesia. If the node is positive, surgeons typically do a regional lymph node dissection, removing the entire axillary lymphatic contents. “Even if it’s negative, we will perform immunohistochemical stains to see if there are any cancer cells circulating and do a complete exam in this way. [The patient] may even have small clusters of cells that are only picked up that way,” says Jones. Subsequently, they examine them with permanent sections to confirm the frozen results. Jones estimates that the sentinel node frozen section is probably 95 percent accurate. Immunohistochemical stains may also be used with lesions that are difficult to definitively diagnose as benign or malignant. “In order to be called an invasive cancer, it has to have demonstrated invasion … It should also look very atypical,” says Stapp. “Sometimes we get something that looks a little atypical but still appears confined to the lobule or duct.” In those cases, they can use immunohistochemical stains to detect whether invasion has occurred or if the cells are still confined. Occasionally the pathologists will encounter a tough case that they cannot make a definitive diagnosis on, so they might send the tissue out to a national expert at a reference lab for another opinion. “We don’t try to pretend we know everything. It’s always in the best interest of the patient,” says Stapp. Despite little-to-no direct contact with patients, pathologists follow them through the continuum of care utilizing a computer system that inventories each specimen. Stapp also credits their excellent staff, who tracks down patient information from other institutions. An indepth reporting system is used to communicate their findings to other physicians. “We complete a synoptic report where we list all things the person who is taking care of the patient needs to know in order to make an accurate stage,” says Stapp. This report includes all the parameters necessary for a treatment plan to be made by the oncologist. The pathologists are quick to note that in addition to filing a report, they are always available to discuss cases by phone with their colleagues. The Floyd Memorial Cancer Center of Indiana is pursuing accreditation by the American College of Surgeons’ National Accreditation Program for Breast Centers. “In terms of the way we treat the patient, it’s the same standard of care,” says Jones of working towards the advanced designation. The main differences, however, are the addition of bi-weekly breast cancer tumor boards and a nurse navigator, who focuses solely on breast cancer cases. The breast cancer tumor board includes pathologists, radiologists, surgeons, medical oncologists, radiation oncologists, and more. The advantage is that the doctors can collaborate on cases from a multi-disciplinary perspective and ensure they have the most up-to-date, accurate information available to establish the optimal treatment plan for the individual patient. The nurse navigator’s job is to guide each breast cancer patient through the sequential process of diagnostic radiology, surgery, and oncology. “To have someone to shepherd you through the process is really an advantage. It’s a wonderful adjunct and value-added service we now provide the patient,” says Jones. 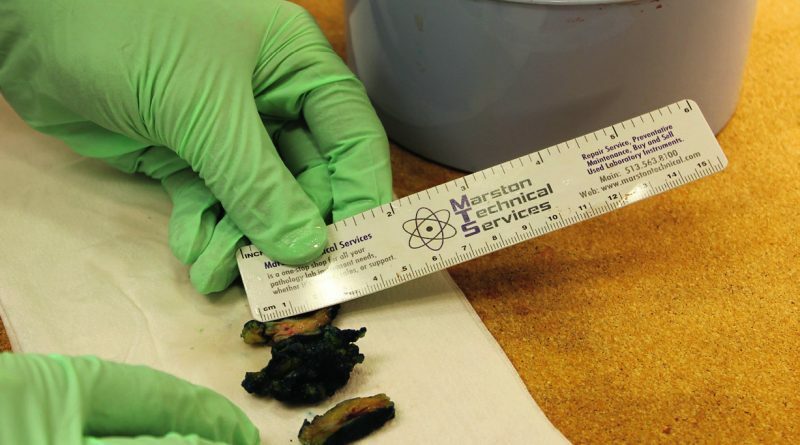 When we get an excisional tumor specimen, we ink it, take our sections and evaluate it under the microscope. From that observation, we’ll be able to tell whether the margins are clear; what type of cancer it is; whether it’s well differentiated, moderately differentiated, or poorly differentiated; and whether lymphatic invasion is present and it has a greater potential to metastasize.